Presidential: When one considers the recent likely voter poll numbers, it appears that Obama has a very good chance of being re-elected during the 2012 election. The polls by Real Clear Politics show that Obama not only holds a slight national lead, but also leads in the vital swing states of Ohio, Michigan, and Pennsylvania. I predict that Obama will win the election by carrying the swing states of Ohio, Virginia, Pennsylvania, Colorado, Nevada, Wisconsin, New Hampshire and Michigan—this translates into 290 Electoral College votes. Romney will lose the election, but will carry the states of Florida (depending upon voter disenfranchisement measures) and North Carolina—this translates into 248 Electoral College votes. In terms of the popular vote, I predict that Obama will win by between 1% and 2% of the total vote. Senate: While polling at the beginning of 2012 suggested that Republicans would retake the Senate, it now appears that momentum has stalled and that the Republicans are unlikely to make any gains. A combination of the presidential coattails effect (people coming out to vote for the president and voting for down-ticket races by partisan affiliation), and the nominations of extreme candidates by the right wing (ex. Richard Mourdock) will lead to a Republican loss in the upcoming Senate election. I predict that Democrats will hold onto the senate in 2012, and will remain in control without a super-majority (it is impossible for the Democrats to capture 60 seats)—the likely result of the elections is that between 52 and 54 Democrats (counting Bernie Sanders as a Democrat) and 48-46 Republicans will be elected to the Senate in 2012. House: During the 2010 election, the Republicans and Tea Party (inasmuch as there is any real distinction) took a vast majority of the House and swept many Democrats and moderate Republicans out of office; this right wing tide was largely due to Democratic demobilization and high levels of Republican voter turnout, thus it is unsustainable for the 2012 election. Since getting into office, these congressman have become immensely unpopular and have presided over the lowest public opinion numbers of any congress in the history of public opinion polling (by some polls, they had a 9% approval rating at their lowest). Due to the presidential coattails effect, Democratic voters will come out to vote in 2012 at much higher numbers than in 2010 and control of the house will become contested. 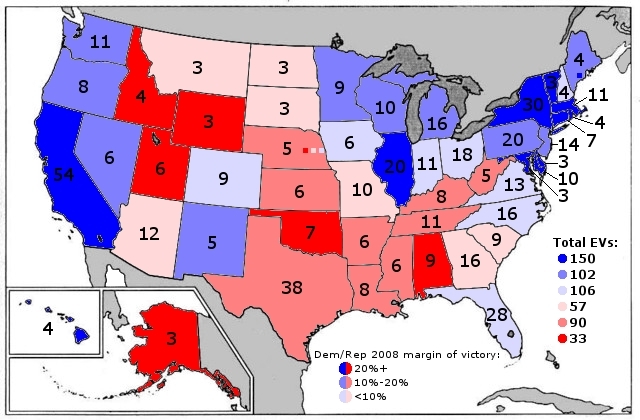 I predict that the Republicans will retain the house, but only by a margin of less than ten seats (probably on the lower side of this prediction); the areas which they suffer most will be the marginal areas (purple states) where a disproportionately large amount of Republicans were elected during the 2010 election. If the early voting polling is any predictor, many of the Republicans to come into power in 2010 will be voted out of office and replaced by Democrats.